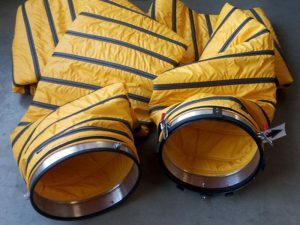 Quickloading GmbH is an innovative company with vast experience in the development of elaborate new tools for air traffic and handling, de-icing, airing and loading of commercial aircrafts. Our team of engineers with practical experience and experienced pilots develop convincing problem solutions for the work which needs to be done hundreds of times each day at any airport worldwide. 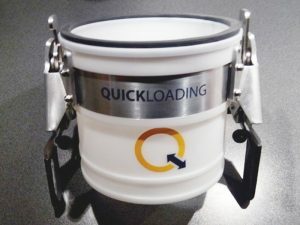 The outstanding products of Quickloading help you to save lots of time and money. Quickloading also offer new developments which, after thorough analysis of existing processes, are planned, optimised and manufactured according to the requests of the customer. In this process, technologies and solutions are created, which immediately convince and stand out in their finish and material quality. Quickloading design their high-quality products exactly for ramp requirements. These have already become established inventory at German and international airports. At Quickloading we offer elaborate, tested and approved solutions which allow for effective minimisation of maintenance and ground time. It’s speed and safety that count most at the ramp! The long durability, multiple usability and intelligent design speak for the Quickloading solutions. 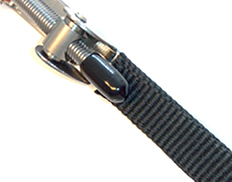 The products comply with the strictest safety criteria and convince with the creativity and solidarity of German engineering. Our customers not only include the biggest German airports (Fraport, MUC Airport, etc. ), but also many international airports. This Quickloading system de-ices the fan blades reliably without expensive auxiliary heating units – at costs, which are unrivalled. 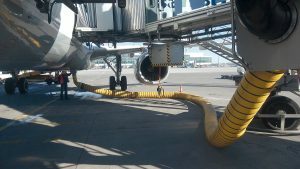 De-icing fluids are prohibited in engines, because they can damage expensive sensors and sensitive components. 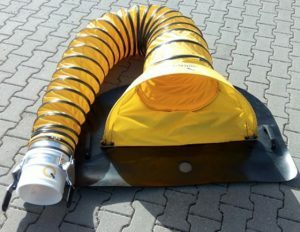 Conventional aircraft heating devices are expensive and usually require the work of two people for a longer period. 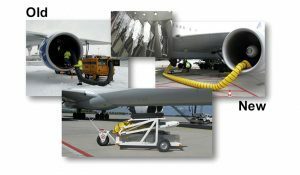 The Quickloading de-icer is simply sensational, inexpensive and saves costs. 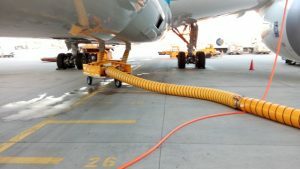 No motor required, as it uses the hot air from the RAM air, the air conditioning output air of the aircraft and feeds this air into the engines. The specially contoured nozzle is laid in the engine and de-ices it fully automatically. The service personnel lay the hose on arrival, remove it before the start and in the meantime they can do the other work on the aircraft. The Quick Towbar Changer combines the reliable, inexpensive and proven type of aircraft Towbar with the flexibility of a Towbar less tractor. 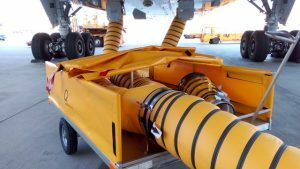 One single Quick Towbar Changer replaces in practice up to 6 aircraft Towbars! Due to elimination of the trip to the towbar depot, fuel consumption is considerably reduced. That is good not only for the budget in time and financial resources, but also for the environment. And availability of the towing vehicle is verifiably increased. Rotating towing eye with shock absorber, floating wheel axle, spring-loaded undercarriage, replaceable skid of hard rubber, holder for spare shear pin for every head and easy adaptation of the tool kit to each particular task. The Quick Towbar Changer is made of stain-less steel throughout. This assures long life and a safe investment. 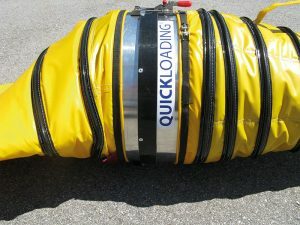 The patented Quick Loading Box speeds up the loading and unloading of baggage items noticeably and arranges them also in a handier, more compact unit together, protecting the baggage. 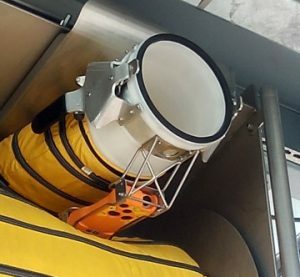 The box was developed for the A320 series and is filled at the terminal and closed with a tarpaulin. 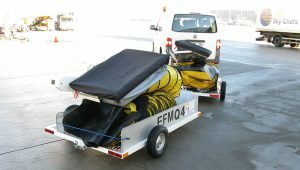 It is only as wide as the baggage conveyor, meaning it can be loaded into the aircraft with standard equipment. 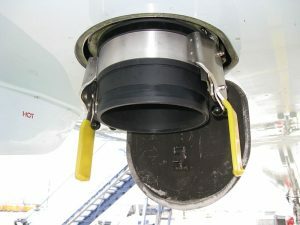 In the aircraft, the box is simply moved with built-in rollers and then locked in place.